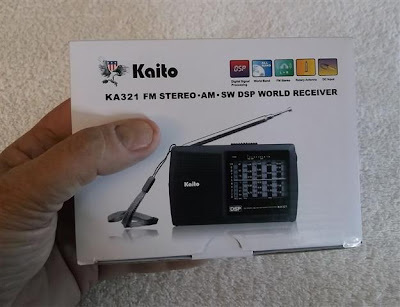 The Kaito KA321 DSP Receiver is one of the newest offerings in the ultralight-sized category of pocket receivers. It tunes the mediumwave, shortwave, and FM bands, and is built around the Silicon Labs Si483x 2nd generation mechanical-tuned digital CMOS AM/FM/SW radio receiver IC. The Si483x uses "the latest in software-based digital signal processing to provide excellent sensitivity and selectivity with minimal external parts and a zero alignment requirement", to paraphrase Silicon Labs' chip specification. Let's see how this unit stacks up. This is my second Kaito radio purchased from Amazon. My radio was sold by Electronnix, Inc. and fulfilled by Amazon. Color: black. There doesn't seem to be any other color available. Fine by me, I prefer black anyway. Amazon continues to create and follow through on a positive selling experience. 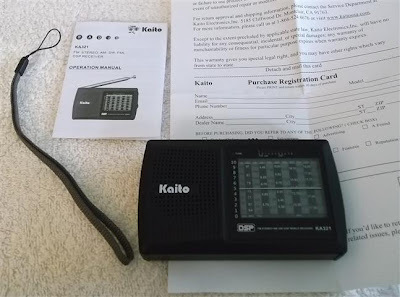 The radio was combined with a book I bought to get the total purchase price over $25 to avoid shipping costs. It was shipped out of Amazon's Kentucky depot and arrived in New York in 5 days via FedEx. A tracking number was provided for the parcel, so I was able to follow its progress the entire way. 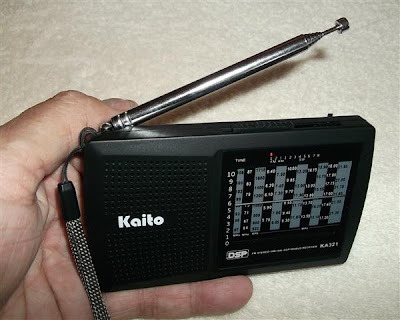 The KA321 is physically tiny, fits in a shirt pocket, and is essentially the same size as the non-digital, purely-analog Kaito WRX911. The Tecsun PL-380 is a little bit larger in width and height. Radio size is 4-3/4 inches wide x 2-3/4 inches high x 5/8 inches deep. That's about half an inch smaller than the Tecsun PL-380 in all dimensions. The radio arrived in good shape. Unlike the full accessory package of the Tecsun PL-380, the KA321 comes with one accessory: a carrying strap. No batteries, no cloth case, no earbuds, etc. Not surprising for a $20 radio. The manual, in English, is not really a manual in book-like form, but a small single sheet of paper folded up in quarters. Included are some graphics identifying the various controls. No schematic or block diagram is included, though you can get a chip block diagram from Silicon Labs which is essentially the entire radio. The instruction sheet format is entirely adequate for this simple of a radio. No setup is required other than to install batteries, which are not included. The radio requires 2 AA batteries. Per Silicon Labs documentation, the Si4835 chip itself is designed to run off of two AAA batteries. In practical use with two heavier-duty AA batteries, battery consumption is very low, and alkalines should last a long time (on the order of 200 hours). The KA321 build and fit quality is good, about on a par with Kaito's WRX911. I found the Tecsun PL-380 to be a notch better. The telescoping whip antenna measures 17-3/4 inches when fully extended, and is stout and of nice quality. 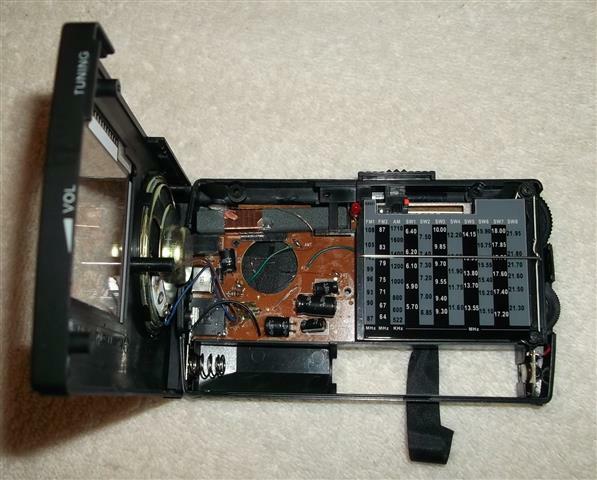 The left side of the radio sports a stereo headphone jack and a 5 volt DC input connector (150ma, center pin positive). No external power source or cable is supplied. Last, a tiny slide switch turns the radio on and off. Two ridged, thumb-wheeled styled knobs protrude edge-wise from the right side of the radio. They are tuning and volume. The volume control is a standard pot, not detented. The tuning wheel is connected to a small but complicated dial string mechanism which also drives a resistive potentiometer. Obviously, it is not detented either. On the top side of the radio you will find a ridged, sliding band switch, almost identical in style to the Kaito WRX911, though the '911's is on the lower front of its enclosure facing forward. A small, red painted dot shows through a series of tiny square holes to indicate the selected band. Get your glasses on if you are over 50. A small (1-3/4 inch) front-firing, round speaker is at the left front. Sound through the small speaker is excellent, perhaps close to the best I have heard in a radio this size. 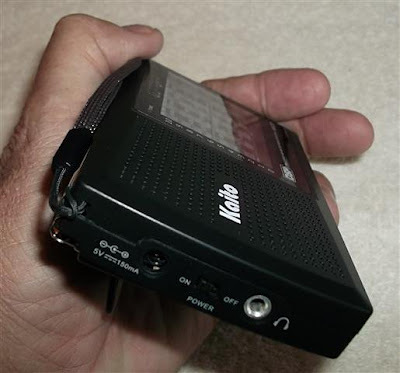 On the back of the radio is a flip stand for elevating the KA321 if set on a flat surface. The KA321 also comes with a handstrap. The battery compartment cover is not hinged, but removable, and could be easily misplaced. The non-LCD frequency display mimics the slide rule style of yesteryear (does anybody even remember what a slide rule is, anyway?). It is not backlit. Two FM bands are represented, the AM band, and eight shortwave bands. There is a lot of information on that little screen. A horizontal dial marker wipes across the front of the radio from top to bottom indicating the tuned frequency. At first, reading the dial is confusing, but after working with it for awhile you will get a feel for it. A small, red LED "Tune" light is at the upper left corner of the dial face. It lights when a station is properly tuned in. The marvelous thing about this little receiver and its hybrid analog/digital, mechanically-tuned chip is that the frequency scales on the dial face are linear and not logarithmic like a traditional analog capacitor/coil tuned radio would be. We all remember the AM band being crammed together up above 1200 KHz on radios of old (and even new). Not on this one. The frequencies are evenly spaced on the dial face, giving more room between kilocycles at the upper end. The radio has no clock or alarm function. Also no memories or channel scanning features. Battery level is not displayed. Of course none of these would be expected in a radio of this style and price range. Tuning is difficult at best on this radio, and you will immediately notice how quirky it feels. Tuning strong stations is not much of a problem, tuning weak ones requires the hands of a brain surgeon. It is an order of magnitude worse than the little analog Kaito WRX911, which takes considerable dexterity itself. A tiny control wheel, some natural dial backlash, and a wonder called "Soft-Mute" implemented on a semi-analog design make this the toughest radio I have ever tuned. 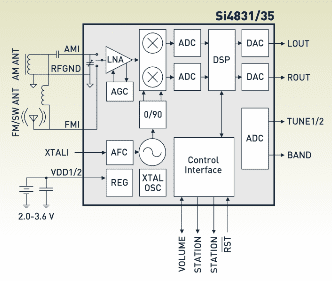 Silicon Lab's all-in-one DSP receiver chips have an internally programmable design feature termed "Soft-Mute". The Tecsun PL-380 had it, so did the PL-360 and to a greater degree the PL-310. These radios used the 1st generation Si4734 chip. I wondered in a different article if soft-mute would be implemented in this design. My fears were realized. Soft-mute, a further lowering of the audio level of the received signal when it drops below a prescribed strength, is undoubtedly meant to provide a more comfortable listening experience for the casual listener and not the DXer. The idea is to relieve the listener from all that nasty low level "static" and "interference", or as Silicon Labs states: "The soft-mute feature is available to attenuate the audio outputs and minimize audible noise in very weak signal conditions." Unfortunate. Low level signals buried in noise are primarily what mediumwave DXers are looking for. 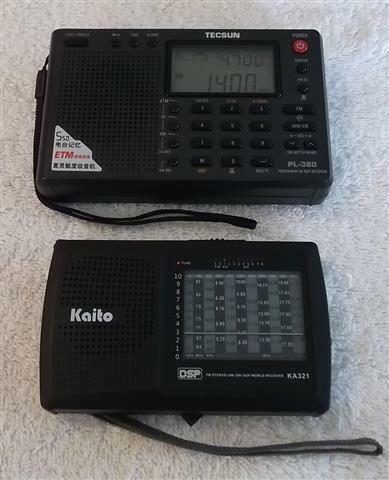 It is evident from the outset that the KA321 (and presumably the Tecsun DE-321) have incorporated soft-mute rather heavily. How unfortunate to have implemented this in a digitally-based receiver attempting to mimic analog tuning. With traditional analog radios you follow the change in background noise as you tune, listening for that peak of low-level audio. Soft-mute so effectively masks the background noise in this radio that the tendency is to go past the weak station before the soft-mute disengages. Maximum soft-mute attenuation possible with the 1st generation Si4734 chip was 16dB, though it was never implemented to this extent. The PL-380 maxxed out at 6db. The KA321 gives the impression that the full 16db has been served up. I decided to do some more snooping through the tech specs on the Si483x chip series to see what I could find, as the specs do not specifically mention soft-mute. I came across this question/answer FAQ about the design merits of this chip series. Question: How is the tuning feel of PVR with Si4831/35, is it easy to tune exactly to a station? Answer: Compared with Si4830/34-A20, the Si4831/35 uses a new tuning algorithm that allows the user to hear one station across a larger frequency range. At the same time, the user can easily feel or tell if the tuned position is the best by the sound. The new tuning algorithm was added to improve the tuning feel and has been well received in the marketplace. The algorithm was carefully optimized such that selectivity was not compromised; therefore, weak station is still easy to tune. Finding and landing on the weak station is the problem. Weakly received signals are still there, theoretically, though greatly audio-attenuated, and may in fact be quite readable if not for the soft-mute. Soft-mute ensures the weak signal remains muted until it is tuned perfectly, at which point the soft-mute relaxes enough to allow it to be heard. The question arises, can we recover a weak signal on this radio using methods like we used on the PL-380? With the PL-380 you could tune 1 or 2 KHz off frequency and advance the volume control to compensate for the muted audio. The theory was: When you tune off the center frequency of the carrier it causes the signal to noise ratio to drop to zero (in fact it does), and the software responds by fully engaging the soft-mute, stabilizing any pumping audio possibly caused by multiple and different strength stations on the same frequency. At that point the volume could be manually raised to counteract the soft-mute reduction. Not possible with this unit. This radio does not tune in such fine steps as 1 or 2 KHz. Careful tuning and listening across the AM broadcast band show that the tuning steps on mediumwave (and undoubtedly shortwave) are 5 KHz per step. This was not evident to me at first, and I questioned why I was receiving a medium to strong station at three different tuning "notches" or steps, as it were. I was fooled into thinking that one tuning step away from the station of interest and I should be parked on a different channel 10 KHz away. Immmediately I suspected selectivity problems. It wasn't until I had the radio for a few days that I realized that each tuning notch was 5 KHz and not 10. The above tuning scenario can be reproduced across the entire mediumwave band should you like to experiment. Medium to strong stations occupy three frequency steps - their own and the two adjacent steps, each 5 KHz removed. You will note that the received strength of the two adjacent steps is somewhat reduced (volume, too) from the primary channel. Presumably, the design attempt is to make for somewhat easier tuning as you "roll through" or tune across a signal, like the experience usually encountered in tuning an analog radio. An attempt to "mimic" analog tuning, if you will. Alas, this is where the new tuning algorithm comes into play, or as Silicon Labs states, "allows the user to hear one station across a larger frequency range". Indeed it does. I suspect they have opened up the bandwidth filter a little to allow at least reduced reception at +/-5 KHz away from the main signal. The PL-380 with its near brick wall bandwidth filters attenuated the carrier almost totally at a tuning offset of 5 KHz unless the station was extremely strong. In any event, overall selectivity and signal rejection does seem to be pretty tight in the KA321, dropping off dramatically past the 5 KHz offset. It is on a par with the PL-380 and does well for me sitting at only 1.2 miles from 5000 watt WXXI-1370. The 5 KHz tuning step brings up an interesting riddle. How are tuning steps handled for this radio outside of the western hemisphere where mediumwave stations are spaced at 9 KHz seperation? Does the factory produce radios with a tuning step based on the shipping location, for instance, a 4.5 KHz step for the 9 KHz spaced world? In the digital world, no law states that the tuning steps even have to be evenly spaced. It's all controlled by software, which can do whatever it wants. It is quite possible that after the software detects that a perfect tune situation is evident (on channel), that the next tune step up or down is 3 KHz and not 5 KHz. It may then apply an 7 KHz (or 6 KHz) step after that to get back on channel depending on the 9 or 10 KHz channel split need. Size comparison. PL-380 (top), KA321 (bottom). I found the sensitivity of this radio on AM during actual use to be greatly lacking. Silicon Labs quotes the sensitivity of the Si483x chip at 30µV for 26db S/N+N ratio. The 1st generation Si4734 chip measured out at 25µV for 26db S/N+N, a little bit better but not a quantum leap better. I would have expected sensitivities to be close in actual use but they were not. Partly the extra difference could be the markedly shorter ferrite loopstick in the KA321 (1-7/8 inch) versus the 3-1/8 inch length in the PL-380. The KA321 responded well after placing a 6 inch Q-Stick type device in close proximity, its sensitivity picking up nicely. But out of the box, I initially wondered if there was something wrong with the radio as all I heard were strong local stations. At mid-day to ensure stable signal strengths, I did a listening test on several frequencies while comparing the KA321 to a few other radios. Signal strengths are in the distant to fringe range and will be a good sensitivity test. Received signal quality was ranked from 0-5 with 5 being the best and on par with near-local reception. Level 0 is no signal or unintelligible audio buried in the noise, and level 1 is just comprehensible audio above the noise. The "X" on the FM line indicates the receiver front-end was overloaded. As you can see, on the mediumwaves the KA321 shows consistantly poor sensitivity results compared to the others. Perhaps I have a dud unit, but since this is an all-in-one chip receiver with no alignment required, I can't imagine why mine would be any different that any other. What surprised me the most was the KA321's inability to pull in any kind of listenable signal out of Buffalo's WWKB-1520. Here is a 50 kilowatt station at only 69 miles distant. It puts in an acceptable signal to every other radio I own - not overly strong on some, but acceptable. On the truck radio it comes in like a local. Unfortunately I have to give a huge "thumbs down" to the KA321 in the sensitivity category. Remarkable was how well the Kaito WRX911 did on AM as compared to the KA321. They have similar loopstick lengths and I would expect their sensitivities to be similar. FM was a little different. Though I didn't do a lot of FM listening, sensitivity seemed adequate and on a near par with the PL-380. FM reception of WBER was not possible on the WRX911 and Sony M37W due to extreme overload and cross-modulation at this location. This is where the excellent selectivity filtering of the KA321 and PL-380 really make a difference. The KA321 employs a very short ferrite bar antenna (1-7/8 inches in length) for the mediumwave band frequencies. FM and shortwave employ the telescopic whip antenna. Signal nulling on MW is excellent and comparable to that of the renowned WRX911. The Tecsun PL-380 and other Silicon Labs DSP chipped receivers seem to have rather odd coupling characteristics when trying to couple the radio to a passive loop or Q-Stick type device to enhance sensitivity. Passive loops seem to tune rather broadly, making it a bit difficult to find a signal peak. I did not find this to be as severe with this unit. If problems are encountered, loose coupling generally works best. The Si4835 chip in this radio also supports an air loop antenna for AM. Air loop support is suggested through an external 1:5 transformer, raising the input inductance 25 times, allowing for an actual air loop inductance between 10 and 20µH. The PL-380's Si4734 chip also supported the air loop in the same way. It would be interesting to rip out the small ferrite loopstick and replace it with an air loop to improve sensitivity. I did not detect any spurs. The PL-380 had plenty. No images were found either. Noise susceptablility seems lower and better than most radios. My guess is that soft-mute contributes a great deal to this, as well as the extremely short ferrite loopstick picking up less energy. Frequency drift tests by Silicon Labs on the Si483x chip series show perfection compared to a traditionally capacitance-tuned radio. Hot and cold tests performed (room temperature to 45C and room temperature to -10C) resulted in virtually zero drift. So the KA321 is as stable as they get. I am trying hard to like this radio but not having much success. Selectivity is outstanding, but the soft-mute and sensitivity issues on AM keep it from being useable unless you like to listen to medium to strong local stations. I have little interest in FM so this is a deal-breaker for me. 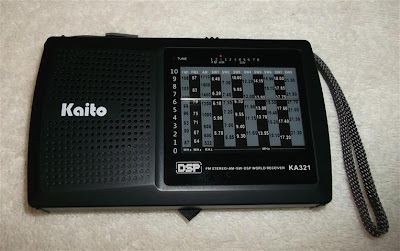 This could have been such a better radio had Kaito and Tecsun (the DE-321) backed-off the soft-mute and enlarged the case to include a longer ferrite loopstick. Sensitivity would have been improved to an acceptable level, as I don't believe it's the chip's fault. 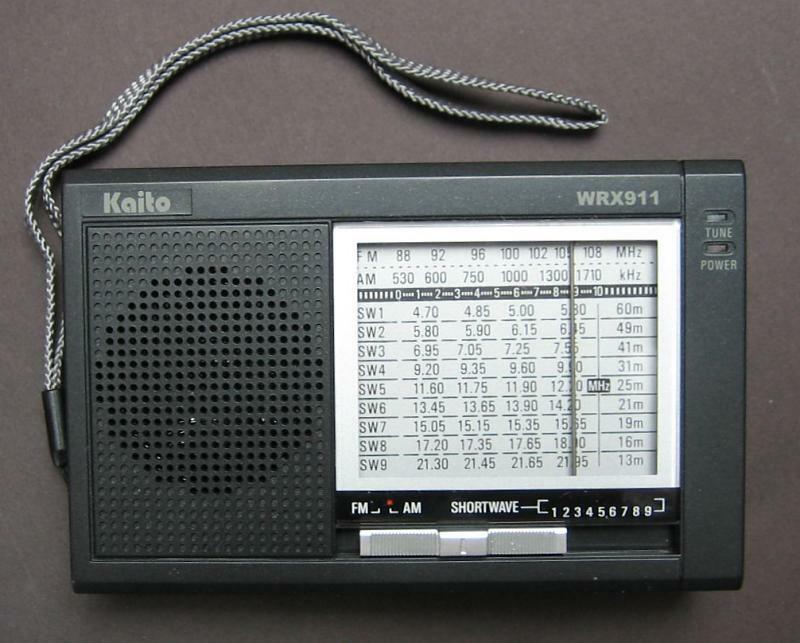 The purely-analog Kaito WRX911, the KA321's cousin, is a hugely better buy for the same $20 bill on Amazon. If you buy the KA321, use it with a passive loop or a tunable ferrite loopstick device to improve the signal capturing ability. You will still have difficulty tuning weak stations due to the quirky tuning characteristic of this chip radio. I am left with the belief that marrying digital to analog in this way is NOT the answer. Perhaps the best way is the way the Grundig S350DL/S450DL does it - a truly analog set with a digital frequency counter to display the tuned frequency, leaving the analog alone to do the thing it does best. As I hinted at in a previous review, the first company that produces a radio using the Silicon Labs all-in-one chips with the soft-mute defeated, the thresholds lowered, AVC adjusted, and includes a matched, 6 to 8 inch ferrite rod is going to have a real DX machine on their hands. My advice: Skip the Kaito KA321 unless you are into experimenting. Some interesting discussions on soft-mute. Search the Yahoo ultralightdx Group. 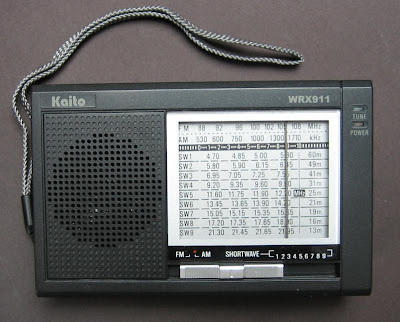 Kaito WRX911 analog receiver. Cousin to the KA321. I wish Tecsun, Kaito (and others) would make soft mute a selectable option on all of their radios, rather than a default setting. Thanks for the review. As much as I like mine, you are correct regarding this radio's several shortcomings. A better loopstick and switchable soft mute would make this a much better radio. But I do enjoy my 321 (albeit with a passive loop most of the time), and its operating simplicity makes it a good gift SW radio. Will wait for the initial offering to be reported on before buying a R2010. I am curious about how the chip differs from the KA-321's chip as far as tuning and sensitivity goes. The '321 was an interesting experiment but a total loss for me. Any idea what the correct power adapter is? I'm having a lot of trouble finding it online. It doesn't look like one made for this radio is available, at least I can't find one either. You might investigate Radio Shack. You need one which supplies 5 volts (center pin positive) at 150 ma or more. Of course, be sure the pin diameter is the same. Good luck and best DX. I don't know of a repair, sorry.